CIRCA 1944 - British Admiral Cunningham and King George VI visit sailors of the US 8th fleet. hd00:55CIRCA 1950s - Blast and radiation measurement of a ground burst during an atomic blast. hd00:20UNITED STATES: 1940s: military jeeps drive along tracks. Dog on jeep. Soldiers march through streets. hd00:45CIRCA 1950s - Soldiers get inland on a beach as part of a military amphibious operation strategy in 1953.
hd00:44CIRCA - 1944 - A camera strapped to a US bomber captures the action as Nazi petrol dumps in France are bombed. hd01:37CIRCA 1950 - Troops and tanks are loaded onto LCMs in Hungnam, Korea. 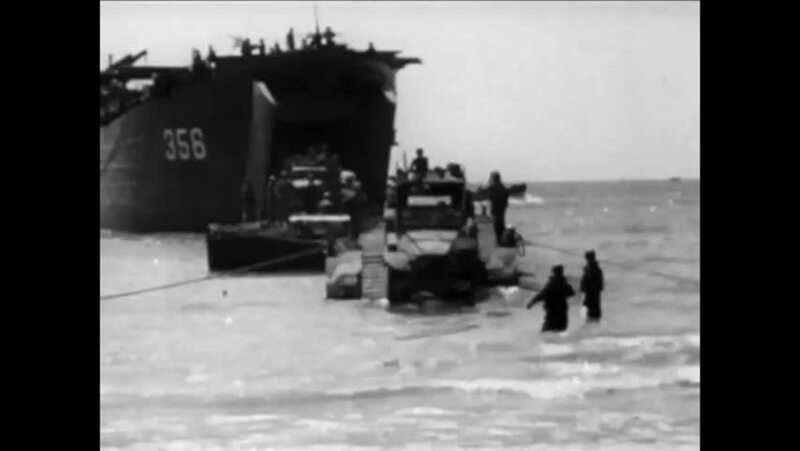 hd00:52CIRCA 1960s - Troops are transported to France by ship on the ocean in the 1940s.